Eye On The World: UK: Muslim students protest at having to share prayer room. UK: Muslim students protest at having to share prayer room. (Newcastle) Muslim students at Newcastle University didn’t like it when the sole prayer room on the campus was made into a multi-faith prayer room. So in the time honoured way of Muslims in the Uk, they held a prayer protest outside against a university’s plans to make them share. It all began earlier this year, when Newcastle University announced the temporary closure of its Muslim prayer space, over the summer while they removed asbestos from ducts. When it reopened- The room had new operating times - The room is now only open on weekdays and between 8am and 1pm on Saturdays- and it was turned into a multi-faith space . Not happy with this Newcastle University’s Islamic Society which want to keep managing the room themselves and are demanding the university overturn its current decision to convert the Muslim prayer space to a multi-faith space. 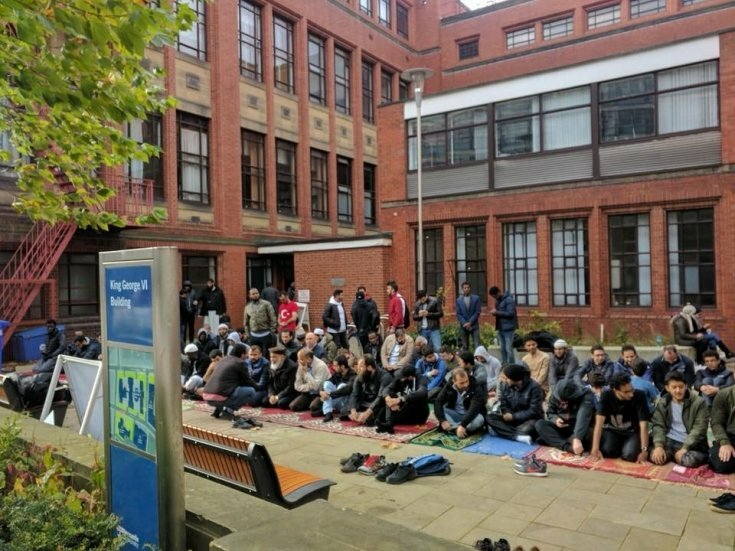 In order to get their way Muslim students took part in a public prayer session outside the King George VI building in al protest against the move. They claim the current facility is already overflowing, with students often having to perform Friday prayers outside the building due to a lack of space, and there is “realistically no capacity to house other faiths’ societies on the same premises”.